On Saturday 22 March, we held our first event of 2014. 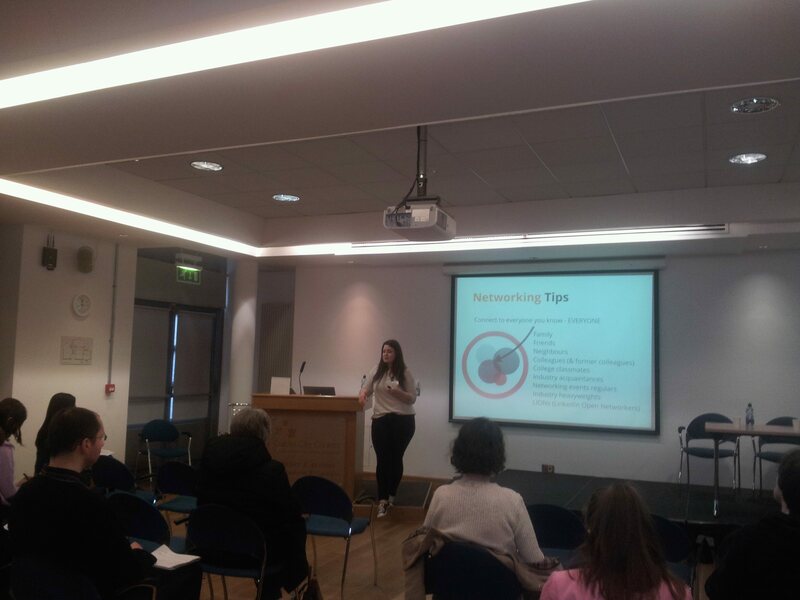 The Interview Skills Workshop was intended as a follow-up to our CV Workshop of last year and we were very excited by the speakers who had so nicely agreed to give up their Saturday to help information professionals on their first (or next) step on the career ladder. Of course, we should mention that the LAICDG have become quite accustomed to the plush surroundings and wonderful staff at the Pearse Street Library & Archives, and Saturday was no different. First up was Holly Fawcett, digital marketing manager at Social Talent with some helpful hints for ‘pimping’ your LinkedIn profile. Many of us have LinkedIn accounts, but some of the points that Holly addressed, even with regards to the basic aspects of LinkedIn, showed that some people don’t utilise it to its best benefit. Holly reminded us to choose a professional-looking photo (no photos of us on a night out, no ‘selfies’, no photos of your pet), write a keyword-driven headline and include your Twitter handle (if your Twitter account is somewhat respectable, of course). Holly also reminded us to include examples of continuous professional development or any volunteer work that you do. You can include this in a specific section of your LinkedIn profile (similar to your ‘education’ and ’employment’ experience). Another area of LinkedIn that we may have neglected (or just never noticed that it existed) was sections such as projects, publications, organisations, and honors & awards. Are you a member of (any) organisation? Were you awarded a prize in college, work or in your community? Were you involved in patents or publications? Did you participate in professional projects? Did you get a great result in college or do you have professional certifications? This isn’t a place for modesty! Holly’s talk was a revelation to many at the event, as she went beyond these ‘basics’ and explored areas such as adding multimedia to your profile page (such as professional talks that you may have given), creating your own one-click invite link, customising your URL, the importance of your summary, and how to attain the desireable ‘all star’ profile status (hint: you need at least three different jobs listed on your LinkedIn page and over 50 connections). Holly also talked about adding nice little touches to make your page a little bit more appealing to any potential employers who may be looking. One that stood out was linking to the logos of companies that you have worked for in the past. Holly was also adamant about the importance of linking to everyone you know. This is important not just for the networking options (six degrees and all that) but because of that ‘all star’ clause. Another aspect that struck a chord with many of us was utilising aspects of LinkedIn that many don’t, perhaps because we are unsure whether they are viewed positively by potential employers. Holly stressed the importance of utilising your LinkedIn Recommendations. These can be particularly beneficial if you ask previous employers or colleagues to recommend you in specific aspects that they can be confident you possess. Overall, Holly’s message was to focus on keywords that will show your dedication to a particular area that you are interested in. From talking to the attendees after Holly’s talk, many admitted that they had neglected their LinkedIn profile page. I have a feeling that a lot of us have some homework to do over the next few weeks. 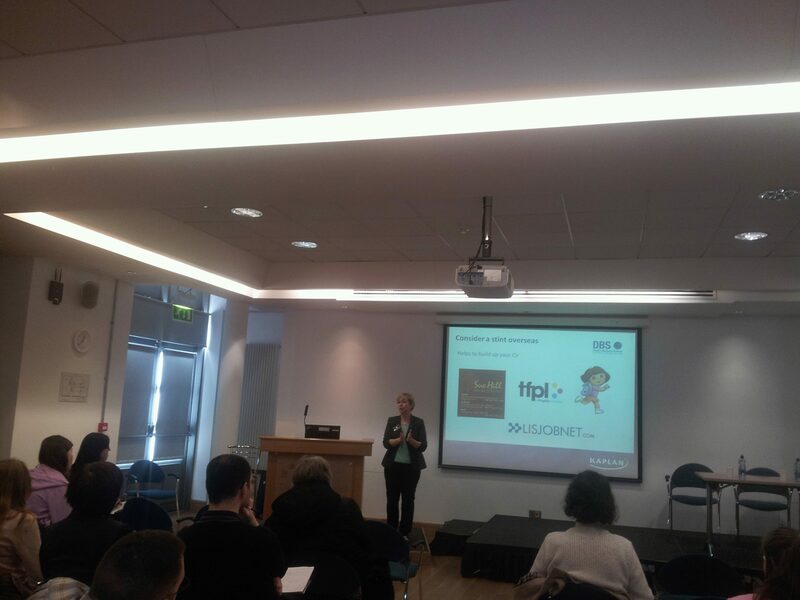 Marie O’Neill, head librarian at Dublin Business School was up next with her talk on ‘Interview tips for the newly qualified or out-of-work librarian’. Marie admitted that it was a tough economic climate out there, and that it was specifically tough for the newly qualified librarian or the librarian looking for a new opportunity. Marie’s central point in approaching interviews was to maintain a positive attitude. Of course there are the core problems with many librarians not having the requisite experience and the severe lack of jobs, but Marie was insistant that we should try and look at the posities. Some recruiters want to hire newly-qualified librarians. Newly-qualified librarians might be more enthusiastic, more knowledgeable about exciting and new developments in the information professional field and yes, sad to say, far cheaper than experienced librarians with years of experience. Focusing on this will at least give you a positive attitude in interviews, making yourself far more attractive to your potential employers and potentially meaning a better interview. Another important point that Marie raised was to take advantage of the free-time that you might have as a newly-qualified librarian, or one that is between jobs, by closing the gap between you and potential competitors for jobs. Take advantage of training opportunities that may arise from being on the dole, build up your CV with voluntary work experience (but the right kind: one that offers valuable experience in a field you are interested in, not simply one that you can put on your CV but teaches you nothing), establish a social media presence (especially on Twitter and LinkedIn), investigate if you can publish in a suitable journal, and participate in professional activities. A very interesting point that Marie raised was the range of (free!) online courses that you can do towards up-skilling. Marie talking about MOOCs (Massive Open Online Learning Courses). You can find MOOCs on academic writing or management. There are even some specifically related towards those in the information field. With all that achieved, you should be confident with regards to that forthcoming interview. But the preparation isn’t over yet! Marie noted that we should approach an interview with ‘forensic style research’. This means not just simply looking at the potential employer’s website, but checking out news articles, professional and academic literature, looking at reports that the institution has published, investigating the institution on LinkedIn and find out whether you have any contacts at the organisation. The basics are also important: turn up on time, dress appropriately, smile and be prepared to use a little (genuine) flattery with regards to why you applied for the post. And what about that old conundrum, what to ask when asked for any questions at the end of the interview? Marie was adamant that it is better not to ask anything rather than open up a potential can of worms. Even those examples that are usually offered as positives can be potentially problematic. The interviewee asking about potential employment opportunities might be assessed as somebody not particularly interested in the role for which they are applying. Asking about opportunities for CPD might be problematic if the library is small or under a tight-budget. A simple ‘you provided me with all the necessary information during the interview. Thank you’ can be far more positive. 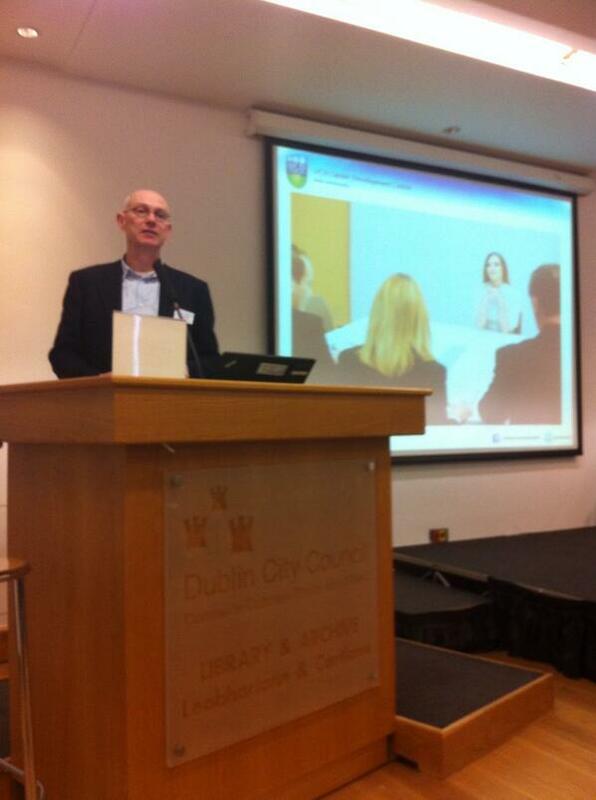 After our break, Mark Cumiskey from the UCD Careers Office spoke about the myths and realities of interviews. Mark stressed the importance of remaining confident. Never think that they made a mistake in asking you to an interview or that they have a candidate already chosen. If you come prepared, you can impress your interviewers. But how can you achieve that? Why did you choose to study …. ? What do you think that you would bring to this position? Give me an example of/tell me about a time when … ? STAR: Situation (be specific), Tactic (your plan), Action (that you took), Result (outcome & learning). You can talk about leadership experiences, a time that you may have dealt with a conflict situation, a time that things didn’t go according to plan, or examples of your problem solving style. as well as work sample or technical questions and possibly hypothetical questions. For these questions, Mark stressed the importance of remaining cool, calm, collected, and reflective. 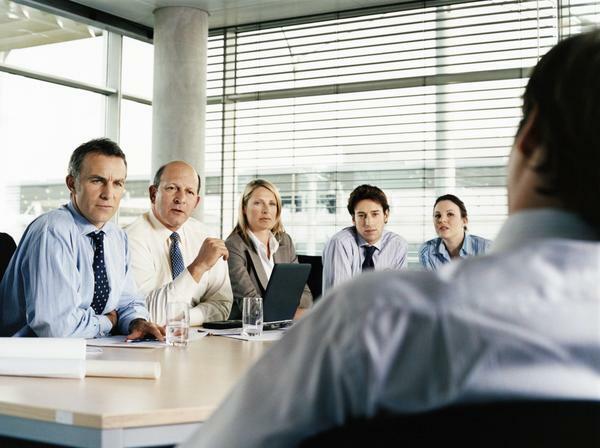 There is also usually the opportunity to ask your interviewers questions. Mark differed from Marie on this topic and suggested that this was an opportunity to show your ambition or understanding of the organisation that are interviewing you. However, it is important to remain focused. Don’t use this as a means to ‘show off’ or use a ‘clever’ question that you read somewhere will impress your interviewers. Mark suggested to keep these questions focused on the job that you are applying for. For example, you could ask about the organisation’s vision for the future development of the role or the influence of macro/micro factors on the organisation. Mark wrapped up with some essential basics. Be well-rested, eat beforehand, arrive on time, be clean and well-presented, be positive (smile!) and sit up straight. When answering questions, remember to listen, reflect, and answer and be clear, concise, and confident while doing so. After Mark’s talk, we divided the attendees into groups for some group interaction on specific questions that they may have but also to facilitate further discussion about some of the points adressed by those giving the talks. Although I, personally, did not get to hear what Mark discussed with his group, Marie’s points about entrepreneurship within the library profession as well as the need for professional advocacy not simply amongst librarians, but towards different professions, sounded like the beginning of a fascinating debate. All of us at the LAICDG thoroughly enjoyed the event and would like to take this opportunity to thank everybody who attended. We got some feedback, but we will be sending out questionnaires soon to get some proper feedback. We would also like to thank everybody who participated in live-tweeting (whether they were in attendance or doing it remotely. You can check out our a selection of related tweets from the event here. Interview Skills Workshop – SOLD OUT! We have had a fantastic response to our forthcoming interview skills workshop. All our tickets are fully allocated. We are looking forward to seeing you all on Saturday! Author laicdgPosted on March 20, 2014 January 28, 2015 Categories Interview Skills WorkshopTags interview, library jobs, professional skills, social media, tipsLeave a comment on Interview Skills Workshop – SOLD OUT! The LAICDG is proud to announce our forthcoming Interview Skills Workshop. The interview can be a daunting experience even for the best of us, especially if we have little first-hand experience. Getting to this stage can seem like a victory in and of itself but it’s important to be prepared. So with that in mind, the LAICDG decided to build upon our CV Workshop of last year and help people with their interview skills. We are returning to the wonderful Pearse Street Library and Archives on the March 22 from 11 am to 5pm with a fantastic lineup of guest speakers as well as that all-important workshop element where attendees can gain practical advice. Speakers include Holly Fawcett who will be talking about LinkedIn, Marie O’Neill on interview tips and Mark Cumiskey on the myths and realities of interviews. This will be a fantastic opportunity on preparing you for that vital stage of getting a job, so booking early is strongly advised .